If you’re looking for a simple side dish to carry you through the fall I’ve got you covered. This recipe is absolutely delicious with minimal ingredients and effort. I was originally going to add breadcrumbs and cheese to the final dish but I resisted the urge because the flavors here are lovely on their own. 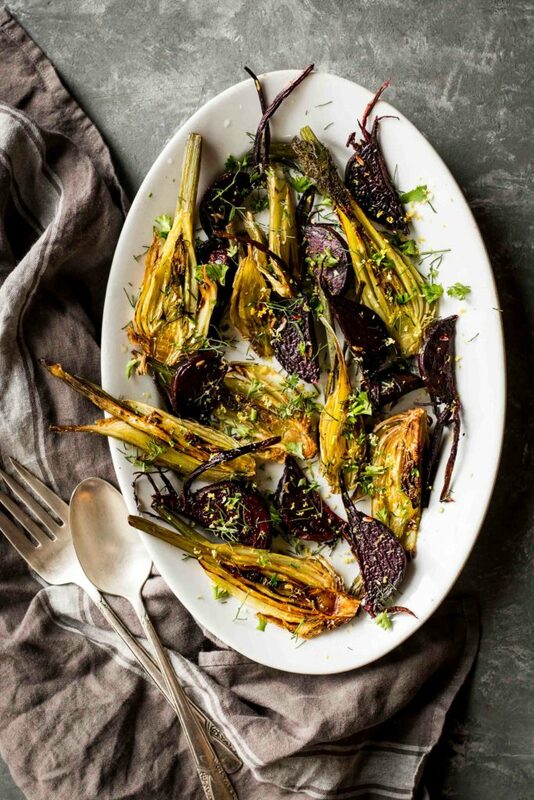 Our CSA members received beets and fennel in their boxes this week and I think this is a great dish to serve up with these two seasonal gems. I’ve always loved the flavor combination of beets and fennel. I’ve made pizzas, pasta dishes and have a soup recipe coming your way soon with these superstar veggies. I know a lot of folks who shop at our farmers market booth (and a few CSA members) who’ve shied away from fennel because they’re afraid it will have too strong of a licorice flavor. However, when fennel is roasted it becomes extremely tender and even caramelizes a bit which brings out a wonderful sweetness. When paired with earthy beets– which also mellow out and become quite sweet– they are the perfect match. I topped the roasted veggies with a simple fennel frond and parsley gremolata (which I know sounds fancy but is super easy to prepare). We enjoyed our roasted veggies with some chicken thighs and a glass of white wine from Cor Cellars (we just joined their wine club and are in love!!!) I hope you all give this recipe a try because it’s always awesome when something so basic turns out so damn delicious! Preheat the oven to 425F. Toss the beets, fennel, fennel seeds, salt and pepper with the olive oil. Place on a rimmed baking sheet and roast in the oven until tender and golden brown, about 35-40 minutes. Toss the veggies halfway through cooking. While the veggies roast prepare the gremolata. In a small bowl mix together the fennel fronds, minced parsley, garlic, lemon zest and a hefty pinch of coarse sea salt. Set aside. Remove the veggies from the oven and toss with the gremolata. Serve warm or at room temperature. Hi Andrea, Love your blog and cookbook! This sounds great, I love both of these veggies. Should you peel the beets beforehand? Hey Adam! So glad you hear you love the cookbook and blog. I don’t peel my beets (or pretty much any other root veggie) There’s plenty of flavor and nutrition in the skin (plus it’s one less step!) However, if you prefer peeling your veggies go for it! It’s all up to you. Enjoy! Two of my favorites together-what could be better!? !